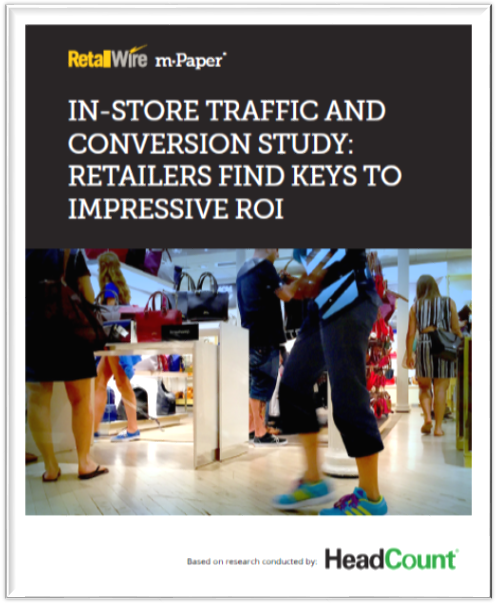 New in-store traffic and conversion study shows net sales productivity lift of 537 basis points with innovative data-driven coaching approach. Download the full study now. This new research study clearly demonstrates the ability of a new data-driven coaching and analytics program to drive net sales productivity in retail stores. The ‘In-store Traffic and Conversion Study’ recently released by RetailWire and HeadCount documents a lift in net sales productivity of 537 basis points during the test period. More than ever, as store traffic softens, retailers need ways to drive real results in their stores – results that include actual revenue increases. This new study delivers that answer, pulling results from seven discrete experiments spanning four retail verticals. Test stores in the study experienced an average sales productivity increase of $.67 per traffic count. When extrapolated for the 600 retail locations evaluated in the study, that would equate to annualized revenue increases of $33 million. “No matter what’s going on in the industry, good results don’t go out of fashion,” says Mark Ryski, CEO & Founder of HeadCount Corporation, a pioneer in the science of store traffic and conversion measurement. With more than a decade of experience working with retailers to improve sales productivity and conversion rates, HeadCount created an innovative, results-oriented approach to data-driven coaching and then devoted nearly a year to proving the efficacy of the program. “Any provider that claims that their solution can deliver an outcome should be able to prove it,” says Ryski. “Our goals were twofold: first, to prove the efficacy of our approach to conversion improvement, and second, to encourage retailers to embrace the A/B test methodology as a way to evaluate solutions like ours,” Ryski says. Download the full study now.